Does Using a Smaller Plate Actually Help You Lose Weight? 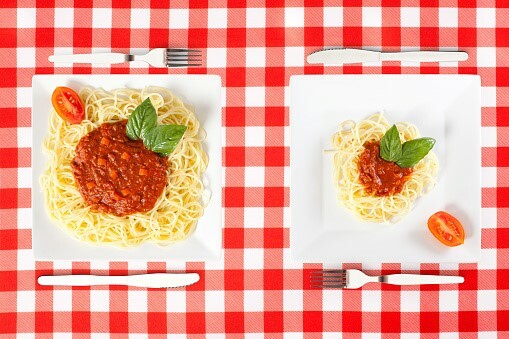 “Food portions in America's restaurants have doubled or tripled over the last 20 years, a key factor that is contributing to a potentially devastating increase in obesity among children and adults,” according to the National Institutes of Health (NIH). And losing weight is hard. There’s no quick fix in order to achieve healthy, sustainable weight loss. There are tips and tricks to make the journey easier, like chewing gum in between meals to fight cravings or drinking water to prevent dehydration and hunger pangs.But perhaps one of the most effective ways to lose weight is cutting down on portion sizes. Many Americans would probably be shocked to discover what is considered the right proportion size for certain foods. So the first step is really knowing how to measure your portions appropriately. And the second, and perhaps more difficult step is actually not overeating and resisting the temptation to refill your plate. One “trick” you may be familiar with to avoid overeating is using smaller plates to serve your food and control proportions sizes. But according to recent research, smaller plates don’t help you eat less when you’re hungry. The idea behind using smaller plates is to trick your brain into thinking you are getting a larger portion. For example, a single scoop of mashed potatoes will look like a larger amount of food on a small salad plate as opposed to on a larger entree plate. But will a smaller plate really make it look like you are getting more food? “Plate size doesn't matter as much as we think it does,” says one of the lead doctors of the research. “Even if you're hungry and haven't eaten, or are trying to cut back on portions, a serving looks similar whether it fills a smaller plate or is surrounded by empty space on a larger one." In fact, a smaller plate may even have a counteractive effect. “When people are hungry, especially when dieting, they are less likely to be fooled by the plate size, more likely to realize they are eating less and more prone to overeating later,” says the doctor. Whether you need to lose weight or not, I think that the focus should always be to eat as many whole, plant-based foods as possible. You have to ensure you get a balanced amount of your nutrients - some of which can be found in fresh fruits and vegetables. These are foods you can eat a lot of. And these types of foods help you feel full! We previously discussed the Volumetrics Diet. Although I don’t really like the word “diet,” the volumetrics way of eating may be beneficial because instead of focusing on proportion sizes so much it emphasizes eating greater quantities of healthier foods. This does not mean you can eat an entire bag of strawberries, but you can eat a larger portion of strawberries than you would be able to eat if you were eating something unhealthy, like candy. You never want to feel deprived or undernourished, and you especially do not want to be nutrient deficient. Being deficient in critical nutrients like proteins, carbohydrates, water, vitamins and minerals will reduce the likelihood of healthy and sustainable weight loss. This is why it is important to take a comprehensive nutrient test. Ultimately, you have to do what is right for your body and needs. What may work for one person, may not work for you. And remember that it’s not about the size of the plate, but rather what’s on the plate.